Motivation – sometimes it’s hard to find it. We’ve all had those moments where we just can’t seem to muster the momentum to get things done. You might feel that you’re getting organized when you have everything you want to achieve on today’s to-do list. Though the truth is, a long to-do list can often act as a demotivator, stopping you from getting things done. 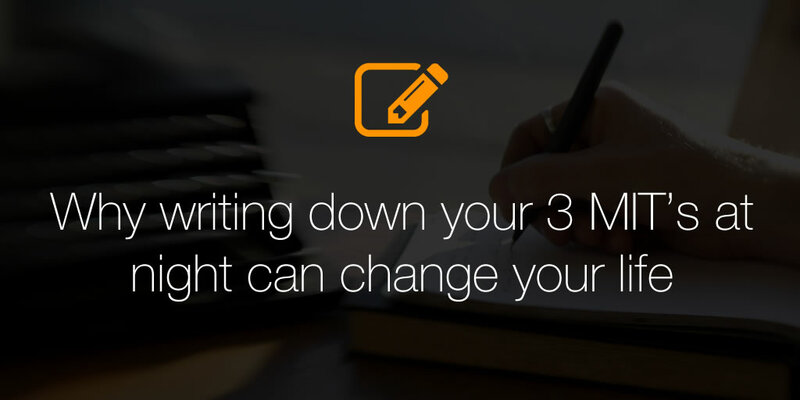 Write down your most important tasks (MITs) and to-dos the night before & limit your to-do list to 3 items. If you’re panicking at the thought of all the things that will be left undone if you do this, don’t. Let’s look at these two steps in more detail to see how they can help boost motivation and productivity. There are many reasons why writing MITs down the night before is a good idea. For a start, it’s a great time to assess what you have achieved in the previous 24 hours, so you know what you want to achieve in the next 24 hours. This type of planning will help you stay on track with your goals and if you do it after completing the day’s tasks, you will be clear and focused. Second, if you write your tasks down the night before, you won’t lie awake thinking about what you have to do the next day. Instead, the act of putting your list on paper (or adding tasks to an online to-do list) allows your mind to relax. Resulting in you getting the rest you need to be efficient and effective the following day. And, since the human brain is so powerful, you will start to process some of the MITs while you sleep! Ultimately bringing clarity and making you more effective the next day. Writing tasks down also helps you in the morning. Firstly, you will get up earlier, because you have a purpose. And when you wake up, there’s no need to wonder what you have to do; you will already know. Being prepared means you are less likely to procrastinate and more motivated to start on your task list. Make this strategy even more effective by writing the first task on a sticky note and attaching it to your alarm (or smartphone or tablet, if that’s the way you wake up). The sticky note strategy focuses your mind the moment you wake up. Now let’s talk about keeping your to-do list to three items. For some people, this will be a hard sell, but think about it: how many tasks do you really accomplish every day? We’re not talking about small tasks that keep the wheels turning, but bigger tasks that benefit your business. If you look back over the last few weeks, I’m willing to bet that you only manage a few each day. A long to-do list kills motivation. That’s because instead of feeling motivated by accomplishing a few tasks, people feel demoralised because of the tasks that they haven’t completed. Long-term, that’s not good for business. Although it seems counterintuitive, limiting the number of items on your to-do list will actually increase your motivation. Three items means there’s enough on your list so you feel a sense of achievement when you finish, but not so much that the size of the list is frightening. According to Vanessa Loder, some people go even further, limiting their daily to-do list to a single item, but three items will work well for most people. With only three items, you are motivated to get started on tasks before being sucked into your inbox. Instead of being reactive to your emails, you can be proactive and accomplish something the minute you start your day. Another great advantage to having a limited to-do list is that it’s easier to decide which task to start with. Rather than having to choose from 20 or more tasks; you can pick the most important task from your list of three and get right to it. Not every task on your list will be a huge item. There are often small but important tasks that hang over your head till you get them done. Sometimes it makes sense to include one of those tasks on your list and get it done, so you can accomplish your other goals with a clear head. By the end of the day you will have accomplished three core tasks that move your business along. As you check off each task, you will feel motivated to complete the next one. That’s the way our brains are wired – that sense of achievement releases dopamine which helps us feel good and more motivated. So what happens to all those other items that used to be on your long to-do list? After all, they still need to get done, don’t they? Yes, they do, and here’s how you handle them. If you need to stop those tasks from niggling at your brain, then write them down on a separate list so you can get some peace. But remember: that is NOT your to-do list. That’s just a list of tasks you don’t want to forget about. You can use that task list to choose your three to-dos for the following day. 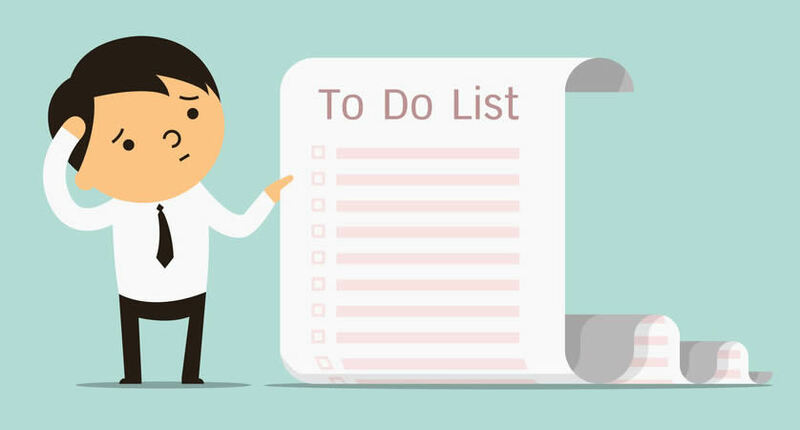 If you get through your to-do list early on a particular day, pick another item from the task list that you can easily accomplish and do that too. You will feel even more motivated and productive when that happens. But – and this is important – don’t use this secondary list to beat yourself up. The only thing you have to focus on every day is your three-item to-do list. Mark these tasks complete and it’s a productive day. The tasks on the secondary list are not a priority unless they make it onto the main to-do list. Combine these two tips like this: Each night, write down the three most important tasks (MITs) you want to accomplish the next day. Give them a priority order if you can. Then relax for the evening and wake up feeling motivated. Plan your daily tasks systematically and get them done by doing one important task at a time. You will be amazed at the effect this will have on motivation, productivity and sales. This has help me a lot I thank You for this information but do you have any help with inbound calls also learning to go from app or page to page. ?